trade safely internationally, whether your customers are in the Australia, New Zealand, EU or further afield. Your customers could be located in any country. 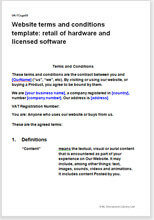 These terms and conditions include provisions for sale abroad as well as within the Australia. This template complies with the Sale of Goods Acts . The Competition and Consumer Act 2010, and other latest consumer protection legislation allowing you to sell to businesses or consumers.